Rationalist Judaism: Who Should We Be Helping On Purim? It began as a normal evening. After eating dinner and spending a few minutes with my family I prepared to leave for Maariv, the evening service. Then the phone rang. On the other end of the line was a member of our community for whom I have great respect. He is a terrific educator and wonderful father. He was not calling with a personal issue nor anything pertaining to his students. He reached out to me because of the two children standing at his front door. On this cold, rainy winter night, he had answered the doorbell and discovered a 12 year old girl and her 5 year old brother. They were shivering and the 5 year old was on the verge of crying. Were they lost? Had something happened to cause them to knock on a random door? They were standing with their hands out, asking for money. What could propel a parent to send their children out into the night, on a bus, alone, to collect from strangers? Was there illness in the house? Did some tragedy, G-d forbid, create a financial crisis? As the incredulous homeowner discovered, there was no issue for this family other than poverty by choice. They had taken a path in life that limited their ability to make a living. Their children, they decided, could better arouse the mercy of kind-hearted Jews, and by going door to door could provide the income their parents didn't. Prior to calling me my friend phoned both the police and social services. He and a neighbor waited with the children until the authorities would arrive. He then reached out to me knowing that at Lema'an Achai we offer the hand up as opposed to the hand out. Thank G-d, the children were brought safely home. A social worker met with the parents to explain that such behavior is endangerment and must end. 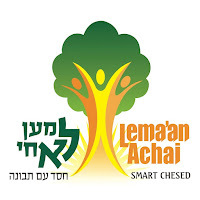 For me this story reinforces the mission of Lema'an Achai and Smart Chesed. Contributing to this lifestyle when there is no illness or extenuating circumstance, only perpetuates the cycle of poverty. The next generation learns firsthand that it pays to put a hand out rather than help themselves through a hand up. Help us strengthen the message of Smart Chesed. The time has come to end the madness. What is SMART Matanot L'evyonim? Purim is the most joyous day in the Jewish calendar. At Lema'an Achai it is especially important as we endeavor to ensure that everyone, regardless of their station in life, can also celebrate. The mitzvah to give Matanot L'evyonim (gifts to the poor) is a central mitzva of Purim day. Matanot L'evyonim allows the less fortunate the opportunity to enjoy like everyone else around them. The families of Lema'an Achai work hard year round in their goal to attain self sufficiency. 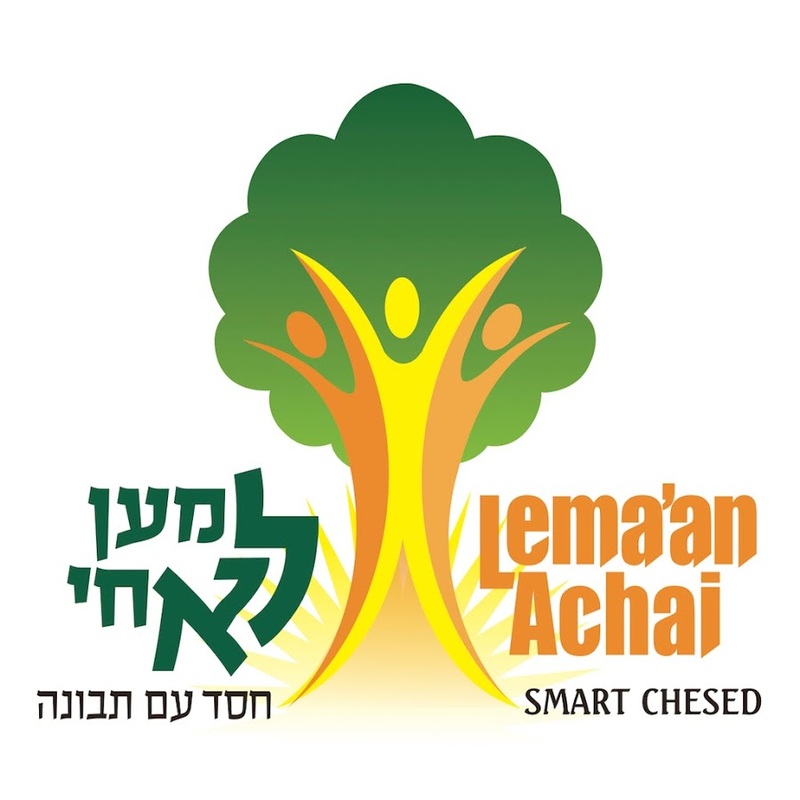 Lema'an Achai's Matanot L'evyonim distribution, discreetly gives to hundreds of needy families on Purim day, thus ensuring that they too, can celebrate with honor and dignity. You can enhance that joy of receiving on Purim by allocating half to be given "Bo Bayom" (on Purim day) and half after Purim. We call that Smart Matanot L'evyonim. It is Halachically approved and spreads the happiness on Purim and beyond. I know the Rabbanim who oversee Lemaan Achai, the people who work there (my wife used to be one of their social workers), and the members of the board, and I can personally attest to their amazing professionalism, wisdom and dedication! Matonos la'evyonim is not the same as צדקה. The concept of אין מדקדקין במעות פורים is that as a day of Simcha, we do not check the full details of who is collecting and why. A day of love and happiness, in which we do not differentiate between friend and foe, we do not judge or care about his motivations, we do not get into his past or future. We give what we can with a smile and a drink. He didn't post on Purim. Matanos L'Evyonim is a Mitzvah, and it pays to be as careful with this Mitzvah as with any other. And if you read to the bottom of the appeal, you see that that's exactly what they're saying. Half goes to the traditional understanding of the mitzvah, and half to their projects. Thanks for posting this, I was looking through the archives trying to remember the name of this organization! You can always identify a cult by spotting child sacrifice. And by the way the IDF is a cult too for many and children are sacrificed, at least mentally, there too. So basically, Israel is not the best place in the world for children. What a horrible "comparison." No one willingly or happily sacrifices their kids in the IDF. Service is required to keep Israel in existence. You can also identify cults by their extreme ideological negative viewpoints about anyone outside the group. My theory is, the reason many Rabbis were against Zionism is due to the fact that the State would never come into being without mass sacrifice. Not so much of life, but of personal ideals. When such an all encompassing ideal becomes the national ideal, our real raison d'etre which is avodas hashem must be relegated or eradicated. The irreligiosity of the founders of the state was no coincidence. Virtually all the "irrelgious" founders of the state came from what we would call "haredi" backgrounds today. Same with the early Maskilim. Sort of makes you wonder why so many people left Torah observance...in fact that majority of the Jewish people. Maybe it was attitudes like yours. See, it is easy for you to sit where you are (NY? Israel?) and let everyone else do the dirty work for you (security, economics) while you snipe at them because everything isn't to your liking. Someone recently wrote "why do we have to live in Israel? Why can't we live in Australia, Canada or the US?" Well, why didn't he say Cuba, Guatemala, Zimbabwe or Myanamar? What do you do if the Canadians, Australians or Americans don't want you there? Why are the obligated to let you in if they don't want you? That was the situation in the period 1933-1945. BTW-You show me ANY country that doesn't have an army or other security forces. Things like violent crime and terrorism are a plague around the world and these people endanger their lives to protect people like YOU , even if you aren't aware of it. Putting your head in the sand and letting other people do the dirty work for you is no solution. What are you going to do if the US reinstitutes military conscription, which is not unthinkable. There is no reason to inaccurately speculate with absurd theories about why rabbis were against statehood. They stated their reasons. 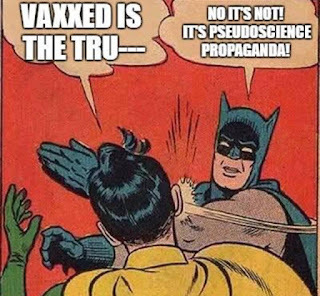 You will never be able to rewrite the history of them being wrong to them being right no matter how hard you try and no matter what philosophies you invent. I heard someone ask Rav Asher Weiss Shlit"a about giving tzedaka. He asked whether he should to give to tzedakas that help people who are learning or to one in Beit Shemesh that helps people get on track (referring to Lemaan Achai). Rav Asher answered "Why can't you give to both?" Lema'an Achai is a wonderful organization, and I am not doubting the veracity of the incident they recount. That said, assuming it did happen, it would be an extreme outlier. I have been living in an area with many kollel families for two decades, and have NEVER seen children asking for tzedaka for their family. So if that is the "problem" Lema'an Achai is there to solve, they can shut their doors tomorrow. Agreed. Ridiculous post. Unless you have an agenda, of course. The only agenda here is yours. Lema'an Achai is obviously not there to solve the problem of kollel families from using their children as beggars. It is there to help and encourage kollel members to get out, get jobs and support their families as their ketubah promises. The beggar children are illustrative, and if you appreciate the work Lema'an Achai does, you would understand that. I love how your ignorance lends you a tone of authority. Just the week before last we had 3 children show up at our door. The oldest was a girl of perhaps 7 or 8 years. When my wife asked what they were collecting for, the girl told my wife that they were 3 of 17 children. When my wife mentioned it to others, we found out this was not the first time these children have been seen collecting for their family. This was in RBS, a place you probably don't know much about. Avi: I love how your ignorance lends you a tone of authority. I actually live in RBS, and have for almost 18 years, and I have NEVER had children come collecting at my door. The only times I have seen children collecting money is them asking asking for a couple shekels to buy candies for their Chevras tehillim on Shabbos. Let me ask you a question: Were these children whom your wife met from any sector of society considered mainstream? I could perhaps believe it about Shuvu-Banim-style Breslav ba'alei teshuva, but not about any products of the "the yeshiva/kollel system" that R' Slifkin is contrasting Lema'an Achai with in his post. MevasserTziyon: If Lema'an Achai is "obviously not there to solve the problem of kollel families from using their children as beggars," they should not use that example in their flyers. Using children as beggars is unusual. Making poor lifestyle choices that condemn one's children to poverty is not. Hence, it is fair for Lemaan Achai to use that example to draw attention to the larger problem. Thank you for inspiring me to give to this wonderful charity.